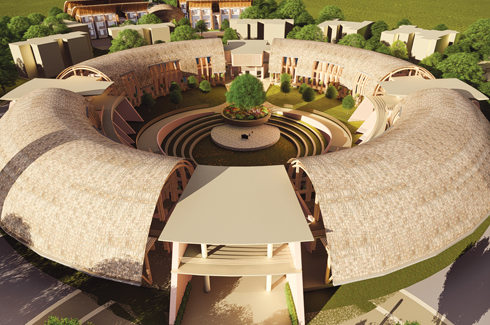 A gargantuan educational campus which is slated to be Asia’s largest training centre built in locally available bamboo. 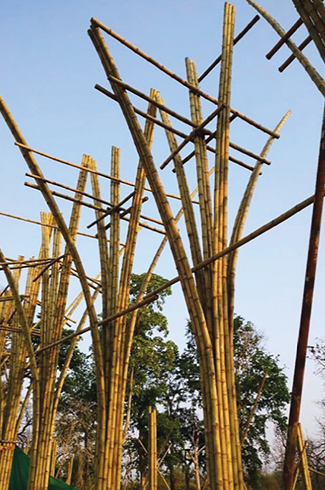 Designed by Studio for Habitat Futures (SHiFt), the Bamboo Research and Training Centre is located in Chandrapur, a tribal area in Maharashtra. 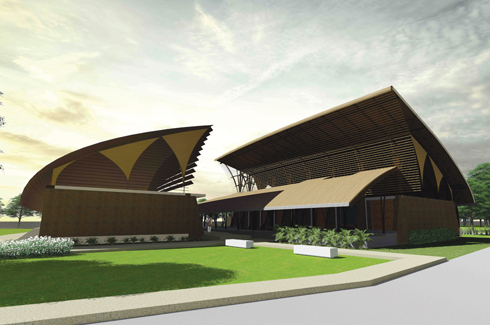 Conceived as one of India’s largest training centre, the entire structure is built in locally available bamboo. Clients (TATA TRUSTS & Forest Department, Government of Maharashtra) recognized the importance of creating livelihoods with indigenous technologies and therefore worked out the project for this Centre at Chichpalli. SHiFt is a group of building technologists oriented towards design for the future. Not a future that is extrapolated from the past with high consumption and high waste but a future that is sufficient, regenerative, and efficient. They are known for their innovative approaches to architecture and project management. They add to the value that their work creates through energy-efficient architecture, eco-friendly design, and people’s participation in planning, as required. 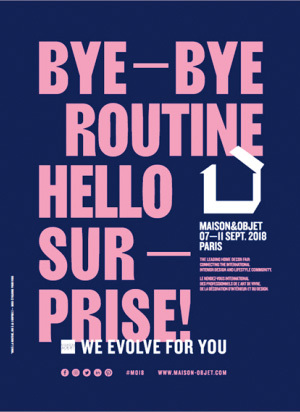 For over thirty years they have been working with passive and low energy architecture, hybrid air-conditioning, autonomous energy and water systems, earth construction, community-based design of common property, and computer-aided design. Their teams comprise mainly of architects, engineers, and project managers with varying backgrounds. This multi-disciplinary mix helps them remain innovative and efficient at the same time. 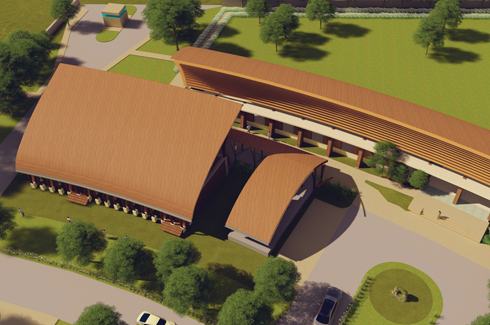 Keeping their ethos in mind, along with the client’s requirement, they have constructed this monumental structure. The tribal people here depend upon non-timber forest produce for livelihoods. This is best provided by training and research into converting indigenous and abundant bamboo into useful products. It was fitting that such a training centre be designed and built in local structural bamboo, which the design team has done. The centre which is expected to be completed by 2019 shall provide such training at a minimal investment and sequester about 8400 Tons of carbon. The project creates an opportunity for disenfranchised tribal communities of central India, an area with a bamboo-based culture going back to ancient times, to transfer their skills from traditional slash-and-burn agriculture and harvesting non-timber forest produce to crafts and manufacture. It is important that this work is being proposed by using a local material like bamboo and skills that can be retrained from traditional ones to come up to date in modern workshop-like settings. Indigenous people need to work with technology that they can identify with and own. India needs to create new opportunities for high quality job creation with economic growth while working within global environmental limits. 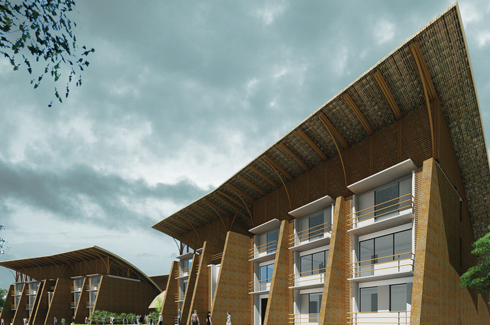 The idea that this can only be accomplished with creation of sustainable livelihoods is not new but the provincial government is finally putting this idea into practice by promoting a training and research centre that will produce about 1,000 alumni annually trained in bamboo structures, furniture, small products, crafts, and related technologies. It would be a missed opportunity to house such a centre in a concrete and brick building which is the mainstream in construction today. 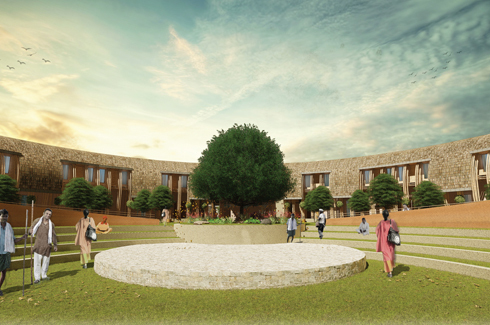 The campus is designed using materials that are low in embodied energy and easily available on site. 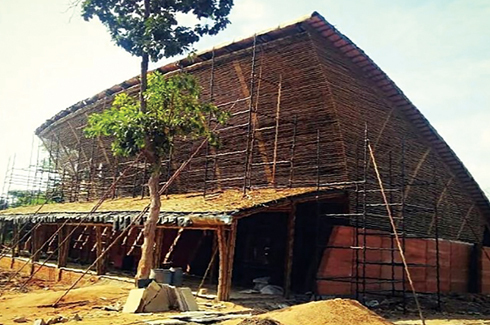 Excavated soil was used extensively to create rammed earth walls while Bamboo has been used as the primary structural element for columns, roof, and beams. Identifying appropriate species, engineering of joints and treatment were some of the key aspects of the design that were mastered through research, trials and exploration.